*In this post I have linked to one of my favorite brands on Amazon. If you happen to click through and purchase, a portion of the sales will contribute to the longevity of this here blog! We shop & support local businesses when and however we can. However, when we can’t find something locally, Amazon is a wonderful fix, and we are pleased to be affiliated. Hoorah! We spent the evening fishing last night. 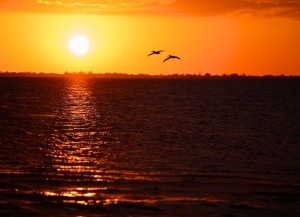 No keeper fish, but any day that ends watching the sunset on Pine Island Sound is a good day. I brought along a special mason jar drink in this new koozie. I really love mason jars. Pinterest has endless ideas for using them (chandeliers and vases) and gadgets to make them even more functional (drinking lids and soap dispensers). But of all the mason jar-related inventions, the Mason-re koozie is my favorite. I used to wrap napkins around the jar any time I filled one with hot drinks to insulate and protect my hands. (No, beer koozies don’t fit.) So I thought about a mason jar koozie, but I never thought of one made of silicone. I wrote to the people at Mason-re to tell them I love it. They gave me and all my readers 10 percent off for the next two weeks. Use the code SuwanneeRose when you checkout. Do you use mason jars for anything special? I’m something of a mason jar enthusiast. Remember my DIY foaming mason jar soap dispenser? And this photo to the right is a little shelf in my kitchen — notice the variety of shapes and sizes so elegantly on display. Because mason jars are just so versatile! It’s a vase, it’s a drinking glass, it’s a leftover food container… no, it’s a mason jar! Plus they’ve got that whole classic-vintage-chic appeal going on which really no one can resist. And of course, the best thing about mason jars is that they are glass. And not plastic. Which is just awful, in case you forgot — even BPA-free plastics are filled with hormone-disrupting chemicals, plastic production is a significant source of air pollution, and plastic pollution persists for centuries. So needless to say, when I first learned about the Mason-re mason jar koozie, I was besides myself. This is why we focus on the mason jar – one of the most versatile and reusable products out there. From canning, dry food storage, home decor, and drinkware, the mason jar has hundreds of uses. 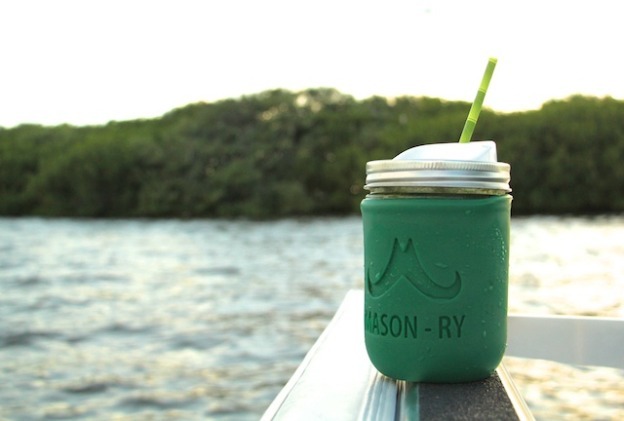 Mason-re notes that silicone is the best material for an eco-conscious koozie — no animal hides or petroleum products, just a single natural and easily sourced material. Plus, silicone can withstand temperatures from below-zero to over 400ºF, is non-toxic, and can be microwaved, dishwashed, and dropped. This silicone koozie thus instantly transforms your mason jar into a travel coffee (hot or iced!) mug or durable food container to be tossed in your bag without a care (mason jars are leak-proof and the koozie helps keep the glass safe). What more could we ask for!? Mason-re is a start-up with an eco-conscious brother-sister duo behind it. Eric and Nicole hail from Denver, CO. Eric is a law student and Nicole does marketing for a local music festival and hosts a bluegrass radio show. They created the Mason-re mason jar koozie as a side project to put their passions both sustainability and mason jars into practice. Needless to say, I feel good supporting these two young visionaries and their awesome product. Right now, Body Unburdened readers get 15% off Mason-re mason jar koozies! Eric and Nicole are generously offering a discount to Body Unburdened readers from now until the end of the month (9/19/14 to 9/30/14). Simply enter coupon code “bodyunburdened” at checkout to receive 15% off your Mason-re order. They currently have green, black, and purple koozies in the store — check ‘em out! Remember, the holidays are but a few short months away. And a Mason-re mason jar koozie would make the perfect stocking stuffer or small gift for anyone on your list. Pair it with a reusable stainless steel mason jar lid, a set of reusable stainless steel straws, and a bag of fair-trade organic coffee and you’ll be the best gift-giver of the season, hands-down. A few weeks ago, I was researching local, whole bean, fair-trade, small batch roasted organic coffee. It was a tall order, but I found a company that is literally two blocks away from my home. I contacted this cute husband and wife team, and their customer service was absolutely phenomenal. Backyard Beans is located in Lansdale, PA and sells their amazing coffee every Saturday at the Lansdale Farmer’s Market. 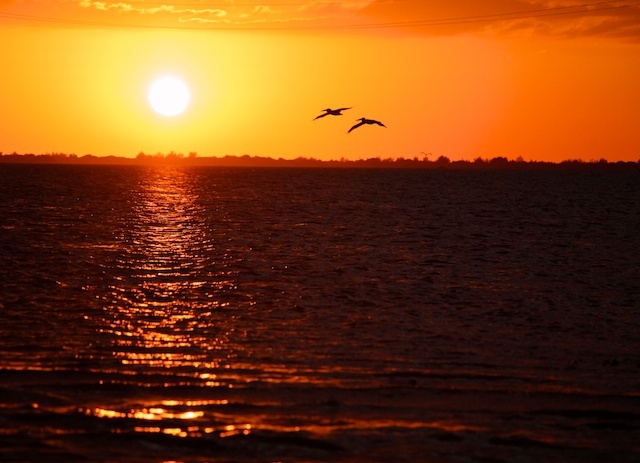 If you’re looking for a down to earth, local business to support, look no further! Micro-lot coffees are set apart from average coffee beans. Micro-lot coffee is high-quality, single-origin coffee from a single farmer's field. Because the coffee is from one field, there is limited availability. Micro-lot coffee is the best of the best...Micro-lot coffee is produced by a single farmer, but is not part of that farmer's entire production or farm. To produce a micro-lot, the farmer chooses the best plot of land - that is producing the best tasting coffee - and invests extra time, effort, and money into harvesting and processing these beans separate from the rest of the farm. The farmer doesn't know which area will produce the best coffee from year to year, so he must always be on the look-out for potential micro-lots. Because micro-lot coffee can bring better profits to the farmer than typical coffee, his investment usually pays off. In non-micro-lot coffees all the beans from the farm (or several farms) would be harvested together - mixing the average beans with the excellent beans. Creating a micro-lot gives the excellent beans a time to shine, since their quality is not diminished by being mixed with the others. The result is a higher-quality, more consistent coffee with more distinctive taste characteristics. Visiting their table at the Lansdale Farmer’s Market will unveil a very special treat; cold brewed coffee dispensed from a kegerator. It’s delicious, perfect black with a smooth and almost creamy flavor and depth that is out of this world! There, you can also purchase your whole bean coffee. Take the time to read the packaging – each bag details the name of the farmer who grew it, its origin, the altitude it was grown at and the process in which it was dried. I love the decaf for my cold brewing, but we’ve tried the Honduran Micro-lot grown by Oscar Omar Alonzo and it has become a household favorite for traditionally drip brewed coffee. We’ve also tried the Costa Rica, but keep going back to Oscar’s micro-lot…the flavor is just perfect! In addition, their decaf does not go through a chemical process to remove the caffeine like many other coffees do. I’ve happily enjoyed my hot coffee in my mason jar with my Mason-re koozie – the seamless addition that keeps my fingers from burning. These cute silicone koozies can be added to any wide mouth mason jar and used in conjunction with Eco Jarz lids to make it a travel mug. Do yourself a favor and invest in a coffee grinder. It doesn’t have to be fancy or expensive. In fact, I purchased mine at a local thrift store. Grind your beans immediately before brewing them. The experience will give you something to enjoy while you rush through your morning. You will not do this beautiful coffee any favors bygrinding it ahead of time. In fact…it would be an injustice. Those flavor notes that disappear within 20 minutes of grinding will be in your cup and not in the air where you can’t drink them. You’ll thank me. I promise. It takes a lot to impress me when it comes to coffee. I love the flavor and the different notes so much that I don’t even drink it for the caffeine most of the time. As I write this article, I am sipping cold brewed Backyard Beans decaf coffee with So Delicious Pumpkin Spice Coconut Milk and Coconut Milk Whipped Cream (which hasn’t hit shelves yet, review coming soon). It’s the perfect non-dairy, delicious fall treat! I tried several different cold brew coffee recipes and techniques and found that about a half cup of medium ground coffee beans to a full quart mason jar of cold filtered water makes the perfect concentrate at the strength I like it. I highly recommend using a cold brew coffee filter by mikknits on Etsy. She sent me several to try. They’re well made, easy to use, dry quickly and work perfectly! I just suspend my filter from chopsticks over the mouth of my jar, dump the coffee and water in, and then leave it in the fridge for about 16 hours to enjoy later. Easy! Want to know more about this awesome local business? Read more here! Find them on Facebook and Twitter to stay in touch. Find Mason-re on Facebook, Pinterest and Instagram. See below for links to previous reviews for Eco Jarz and So Delicious products! Did you enjoy this article? Make sure to hit ‘subscribe’ at the top of this page so that you never miss an update, and visit me on Facebook and @PhillyGreenLife on Twitter for more green living tips, product reviews and articles! Mason jars are, I think we can all agree, pretty awesome receptacles for drinking more or less any type of beverage but, if you’re like us here at Coolector HQ, then chances are it will be one of either a] coffee or b] craft ale. Well, mason jars are about to get a good deal more excellent courtesy of this top notch looking accessory that goes by the name of Mason-Ry Silicone Koozie by Oregon based designer, Eric Harvey. We’re often drinking on the go at The Coolector and have been on the lookout for a cool carry to port our sometimes coffee / sometimes booze (sometimes both) around in and I think we’ve found exactly what we’ve been looking for with this cracking Mason-Ry Silicone Koozie which is currently drumming up support over on Kickstarter so you can grab one for a bargain price before they come to market. 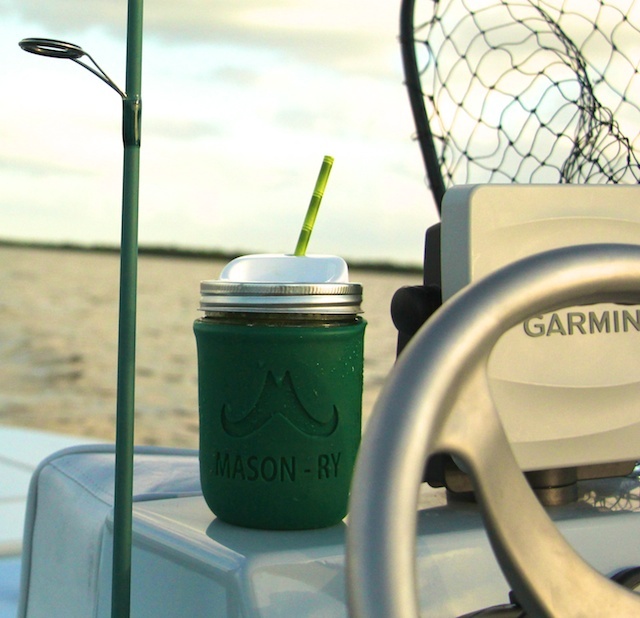 The idea: A silicone koozie for pint-size mason jars, from Oregon-based Mason-ry (mason-ry.co). Progress: Objective: $7,500. End Date: Aug. 8, 2014. The spark: Harvey initially came up with his idea for a mason-jar koozie about three years ago; last year, after coming home “freshly stoked” from the Eugene Startup Weekend, he was inspired to move forward. His goal was to create a hot/cold drink insulator that looked and felt great, and, most important, was eco-friendly and multi-use. He spent the past six months designing, refining, and prototyping the Mason-ry koozie, working with his 24-year-old sister, Nicole, and product designer Alex Caves, 23. Why we like it: Fed up with disposable coffee cups and oil- and animal-skin-based koozies, Harvey decided on reusable materials for his endeavor. The koozie fits 16. oz glass mason jars and is made of silicone, which can withstand temperatures from below zero to over 400ºF—it can be microwaved, baked in the oven, and put in the dishwasher—is non-toxic, and contains no BPA. It was important for Harvey to make a koozie that worked only with glass mason jars, as he believes products that aren’t multi-use are “horrifically un-environmental.” The mason jar, he reasons, is a product most people already own, and can be used for everything from coffee and beer to eating cereal to canning to a decorative vase. He is currently in the middle of a six-state tour of coffee shops and breweries in support of his project. A new Eugene company is taking to the Web and road in hopes of raising the funds needed to produce a special koozie. The Mason-ry koozie, made out of silicone is designed to perfectly fit a pint size Mason jar and take on anything modern man can throw it at, including a microwave, a dishwasher or just plain ol’ concrete. It’s extremely durable, something its makers say is key to reducing our amount of waste these days. “Owning less things that last longer is really in my mind the way to being more sustainable. So in this case, I tried to use the best product that would last the longest and durable and pair it with something that’s the most versatile,” said Eric Harvey, Mason-ry founder. The founder is currently on a road trip to promote the Kickstarter campaign, which ends Aug. 8.